SAP allows all the transactions made by a business to be recorded so as to use that information to make managerial decisions. Every business needs to make payments to its vendors, and also to its customers in case the goods have been returned for which the payment had been made earlier. It becomes difficult to track which payments are due to be made and then to process these payments manually. SAP takes care of this by means of the Automatic Payment Program. The Automatic Payment Program calculates which line items are due for payment and then processes the payment by one of the various methods that are defined in the Automatic Payment Program configuration. The Automatic Payment Program also allows netting of line items i.e. in case payments have to be made as well received from the same business partner, and then SAP determines the net value of the payment to be made or received and accordingly processes the business transaction. The Automatic payment program makes use of the payment terms that are defined in the vendor and customer masters to determine which line items are due for payment. 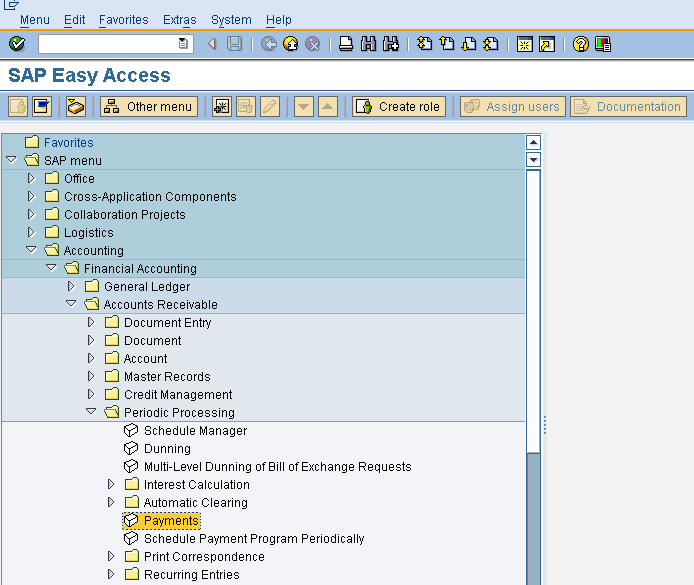 STEP 1: Navigate to the SAP menu as shown in the screenshot below or execute the transaction code F110 to display the Automatic Payment Program screen. STEP 2: It is required to maintain the parameters of the Automatic Payment Program before it can be used to make the payments to the business partners. Enter the run date and the identification as shown in the screenshot below. The identification can be used to differentiate between several payments runs being executed on the same day. The run date is the date on which the payment run is being executed.